Spirit, an omniscient guide, helps residents of a small town find a missing boy who may have been kidnapped. Living in the idyllic town of Lily Dale has felt like a dream for Bella Jordan, who moved from New York City following the sudden death of her husband. Now Bella runs the Valley View Manor guesthouse and spends most of her time trying to keep Max, her young son, out of trouble. But Max is easy to take care of compared to neighbor Misty Starr’s son, Jiffy, a curious kid who doesn’t know when to quit. Bella prides herself on values like common sense, something Misty lacks, and she feels more like admonishing the young mother than expressing kinship with her, even though Max and Jiffy are close friends. Misty tries to keep an eye on Jiffy through his daily ramblings, but she’s been distracted more than usual lately by the news that her military husband won’t be home for Christmas. Michael refuses to call Lily Dale his home, and he’s wary of the very idea of a guiding Spirit, even though Spirit is what brings most people to Lily Dale. In her role as a psychic, Misty is a natural believer, and even Bella finds herself thinking that Spirit may be communicating with her. When Jiffy doesn’t come home from school one day as a winter storm approaches, both Bella and Misty worry that something has gone wrong, and when Max cheerfully announces that Jiffy knew he was going to get kidnapped, the two mothers must spring into action and work together despite their very different parenting styles. 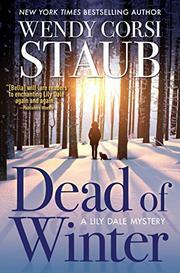 Though Staub’s look at divisiveness within communities, especially differences over child-rearing, addresses some serious real-world concerns, the lack of focus in her small-town setting and her use of outsiders as the bad guys do little to develop the world of Lily Dale (Something Buried, Something Blue, 2016, etc. ).